Betta fish, known for their beautiful colors and fan-like tails, are a popular purchase at pet stores and aquarium suppliers. While the males are aggressive with one another, bettas can often make great additions to mixed aquariums, provided you follow some simple rules. To prevent temperature shock when bringing them home, introduce them slowly instead of dumping them in. When betta fish are moved from a warmer bag or small aquarium to a cooler habitat, they may go into shock. Even once they're acclimated to that environment, sudden drops in temperature can also shock them. If the temperature drop is too great at one time, they can die. If they do not die and you bring the water temperature up, they will likely survive, but it is a much better idea to introduce them to new environments slowly in order to avoid this outcome. Betta fish are tropical and may go into shock at temperatures below 74 degrees Fahrenheit, though it is more common for them to react poorly when temperatures drop below 72. Drops may occur when you change aquarium water or your home's temperature drops for long enough to affect the tank. If this happens, slowly add small amounts of warm water to the tank until it's at least 74 degrees. (Remember to treat any water you add with a conditioner to remove chlorine and chloramines.) If you need to, move the tank to a warmer location. When changing tank water, always heat new water to the temperature of the tank. As tropical fish, bettas prefer temperatures between 75 and 82 degrees, so you will need a small tank heater to keep bettas happy in most homes. If your new betta arrives in a plastic bag, float the bag on top of the tank for 20 minutes. Remove the bag from the top of the water, open it and add half a cup to 1 cup of aquarium water to it. Repeat the process using 20-minute intervals until you’ve at least quadrupled the amount of water in the bag. At this point you can introduce the betta to its new environment. Another possible problem is disease. To protect the health of your preexisting fish, if you have them, you should quarantine bettas in a separate environment for four to six weeks, monitoring them for problems. If none appear, you may introduce the betta to the other fish after this time. Similarly, to protect betta fish already living in tanks, keep other new fish away from them until they have undergone quarantine. Use temperature acclimation methods for any new environment. Although bettas have a reputation for being “fighting fish, ” this is not always the case. While you should not house two males together, it is generally fine to put male betta fish in the same tank as other fish, and to keep two or more females together. 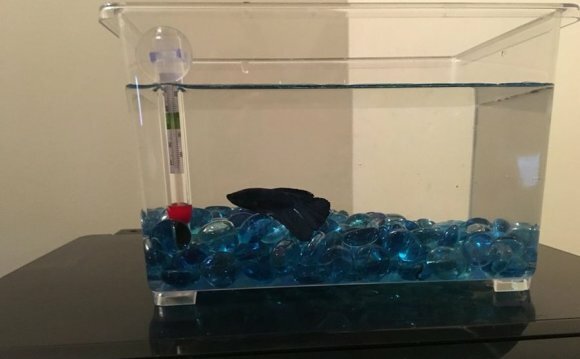 You might see bettas on display at the pet store in tiny glass dishes with only a little water and a single plant, but this is not a healthy environment. The water surface, from which they get oxygen, is too small, and contrary to myth, plant roots do not provide enough nutrition for these carnivorous fish. Instead, feed them well-balanced fish flakes.